CJ Sturckow guided Virgin Galactic's private SpaceShipTwo through an unpowered "glide flight" in the skies above California's Mojave Air and Space Port. Any test pilots hoping to match Rick "CJ" Sturckow's resume must now be feeling seriously discouraged. The former NASA astronaut, who has four space shuttle missions under his belt, got behind the wheel of Virgin Galactic's private SpaceShipTwo spaceliner for the first time earlier this month, guiding the vehicle through an unpowered "glide flight" in the skies above California's Mojave Air and Space Port. 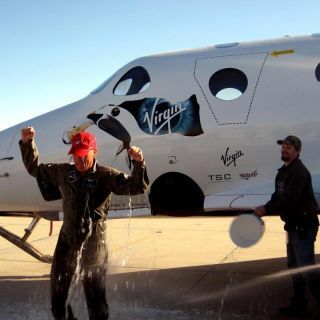 Friends and colleagues doused Sturckow with water on the runway to celebrate the successful Jan. 17 SpaceShipTwo test flight, which marked his first spacecraft landing since bringing the space shuttle Discovery down safely in 2009. Former NASA space shuttle commander Rick "CJ" Sturckow smiles and shakes hands after flying Virgin Galactic's SpaceShipTwo to a landing at California's Mojave Air and Space Port after a glide test flight on Jan. 17, 2014. ‪"#SpaceShipTwo is back on the ground after another important glide flight, which proceeded as planned. Good job, team!" Virgin Galactic officials tweeted on Jan. 17. Sturckow joined Virgin Galactic after a long and storied NASA career. For example, he served as pilot for the space shuttle Endeavour's STS-88 mission in 1998, which was the first shuttle flight to the International Space Station. Sturckow also piloted Discovery on its STS-105 flight in 2001 and commanded the STS-117 and STS-128 missions, which were flown by the shuttles Atlantis and Discovery in 2007 and 2009, respectively. The Jan. 17 SpaceShipTwo glide flight came just a week after the vehicle made its third-ever rocket-powered test flight, which saw it set a company altitude record of 71,000 feet (21,641 meters) and accelerate to 1.4 times the speed of sound. The six-passenger SpaceShipTwo is designed to be lofted to an altitude of about 50,000 feet (15,000 m) by a huge carrier aircraft called WhiteKnightTwo. At that point, the spaceliner is dropped and engages its rocket engine, which blasts the craft onward and upward to suborbital space. Virgin Galactic expects SpaceShipTwo to become fully operational later this year. Passengers aboard the spaceliner will enjoy a few minutes of weightlessness and see Earth against the blackness of space, company officials say. The current ticket price for a ride aboard the vehicle is $250,000. In addition to the three rocket-powered test flights, SpaceShipTwo has now successfully completed 29 glide flights. The Jan. 17 test also involved another pilot — Pete Siebold, who works for SpaceShipTwo's builder, the aerospace firm Scaled Composites.